The Pace Study is located on the 16th floor of 41 Park Row, a landmark building built in 1854 and extensively renovated in 1888 that served as the original home of the New York Times and was purchased by Pace College in 1951. The Study served as the office of Robert S. Pace, Pace’s second president and son of co-founder Homer S. Pace. Today it is used for small meetings of special significance to the University. 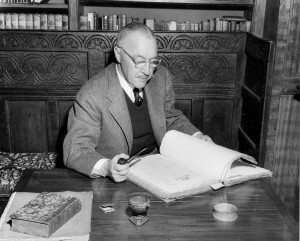 The Study’s many valuable books and objects reflect the varied interests of Homer Pace, an accountant by vocation and a collector by avocation. Homer loved to travel, as is evident from his choice of books. The Study collection contains a number of geographies and books of travel and exploration. Among the geographies are a 1681 German-language geography of Asia, a 17th century Dutch-language geography, Mallet’s Histoire de l’Univers, dating from 1686-86, and a universal geography in Latin dating from 1697. The books of travel are an excellent contemporary history of the age of exploration, with many volumes dating from the Golden Age of the 17th century. Among these are Dampier’s Voyages, 1698-1705, Hawkesworth’s (Capt. Cook’s) Account of Voyages, published in 1773, and Alexander Hamilton’s New Account of the East Indies, 1732. In tribute to these adventurous men, engravings of four famous explorers, Cordoba, Mendoza, Columbus and Magellan, hang in the Study. 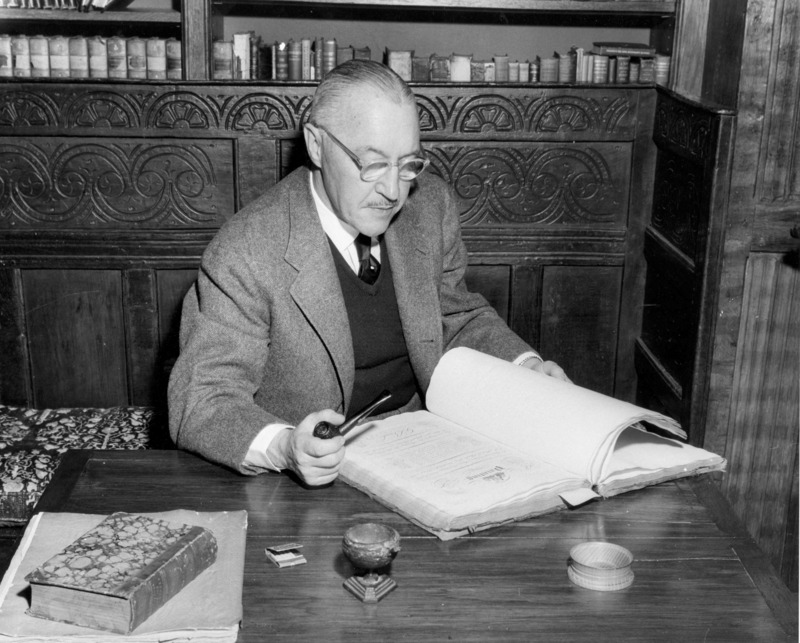 Homer’s collection of rare books reflects his life-long fascination with words. Included are several historic examples of lexicography, among them: Huleots Dictionarie by John Higgins, the oldest volume in the collection, dating from 1572; John Harris’ Lexicon Technicum; Nathan Bailey’s An Universal Etymological English Dictionary, published in 1721; two early editions of A Dictionary of the English Language, by Samuel Johnson, considered the greatest English dictionary of the 18th century; a complete 21-volume set of A New English Dictionary of Historical Principles (Oxford English Dictionary), “the emperor of dictionaries,” in the words of H.L. Mencken; and a ten-volume 1906 edition of The Century Dictionary and Cyclopedia, considered by many lexicographers to be America’s greatest contribution to the field of dictionaries. Thanks to archivist Ellen Sowchek for providing the information and the photograph of Robert S. Pace in the Pace Study. Want to know more about the history of Pace? 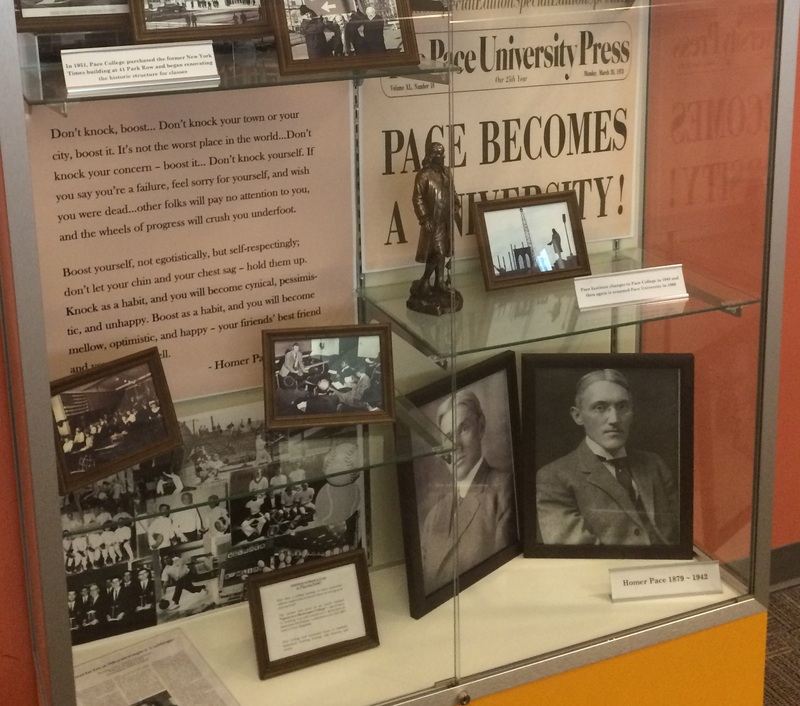 The Birnbaum Library currently has three displays that delve into the university’s history. On the first floor in the library foyer, you’ll find our newest display case, filled with newspaper clippings and artifacts from bygone eras; as you proceed to the second floor, check out the six framed photographs depicting the NYC campus location at different stages over the last century; and when you reach the second floor, take in the slide presentation on the LCD screen above the display table. Thanks to archivist Ellen Sowchek for providing the material.